I wish I had more to say about this camera but it was bought on something of a whim at the begriming of 2005. At the time my F717 was my main digital camera and my OM-2s was still my main go-to film camera. Also, at the time, there was no immediate prospect of a DSLR and all my working film SLR's were manual focus. I had never owned a plastic wonderkin I wanted something auto-focus that would give me a taste of how a DSLR would handle. I set my sites on a Minolta 600si because of its cult following. Instead of the more usual push buttons and menus that were the norm for this kind of camera, the 600si was equipped with knobs and dials. It became known as the AF camera for the old-school SLR enthusiast. 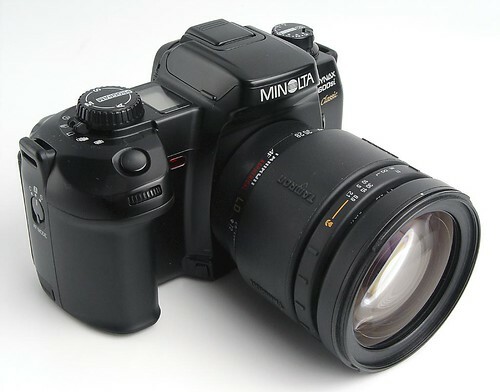 Its control set became so popular that it set the design precedent for the Minolta 9, 9ti, 7, and even the Minolta Dimage 5, 7, 7i, 7hi, A1 and Konica Minolta Diamge A2 digital cameras. The 600si had each dial assigned to one function alone (no combination button presses required). Rocker switches on the back controlled the AF mode metering mode. The camera came with Minolta's legendary 14 segment metering system and was every bit as powerful as the previous pro cameras. The maxxum/dynax 7 is a direct decedent of the 600si as are the pro 9, and the digital SLR 7D. Although it does handle reasonably intuitively I never really took to the 600si putting only a couple of rolls through it before deciding to take the plunge and go the DSLR route after all. I got this example off eBay with a Tamron 28-200mm superzoom for $115 (shipped) at the begriming of 2005. This Tamron lens is probably more responsible for my dissatisfaction with this camera that the 600si body. There are too many compromises that have to be made to cover wide to pretty strong telephoto as this Tamron lens demonstrates. I'm having to close the comments on the 600 for a while due a spammers having latched on to this post. Normal service will be resumed once I work out how to control the spam better.